Summary: Documenting a well-designed experimental study, this article offers clear evidence of the positive impact of teacher-led inquiry on student writing achievement. Teachers in the experimental group participated in inquiry-based professional development to increase understanding and application of effective writing pedagogy in their classrooms. Compared to a control group of teachers, the teacher-inquiry group demonstrated a broader range of writing tasks, longer duration of writing tasks, and explicit strategies to support students in making the reading/writing connection. In addition, students of teachers in the experimental group showed improved achievement in writing on a nationally scored assessment. This article represents an important resource in for leaders planning and/or advocating for an inquiry-based approach to professional development. All of the program and comparison teachers in this study were excellent, experienced teachers, and our observations noted a preponderance of literacy events in both program and comparison teachers’ classrooms. Yet program teachers’ students clearly performed better on multiple measures of their writing. We believe this is due to a purposeful and systemic approach to the teaching of writing. 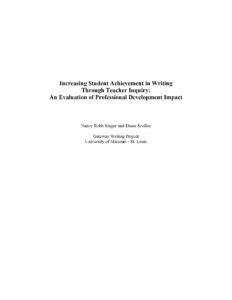 While comparison teachers could articulate facets of process writing (e.g., they could describe a task as “prewriting”), their approach to the teaching of writing was lock-step and linear. Contrarily, program teachers seemed to have a more internalized notion of process writing. Their instruction was recursive; they seemed to understand and embrace the complexity of writing—allowing students choice and time in which to complete writing tasks.